Lithuanian Talmudist and Hebraist; born in 1804; died at Kovno Sept. 20, 1866. After having studied Talmud and rabbinics under Jacob Meïr Yalovker, Scherschewski was employed in one of the business establishments in Wilna, where, in his spare hours, he occupied himself reading rabbinical works and studying the literature of the haskalah movement. In 1852 he was appointed teacher of Talmud and rabbinics in the rabbinical seminary of Wilna, which position he held until his death. Scherschewski was the author of "'Oz Melek" (Wilna, 1857), a sermon and a hymn on the occasion of the coronation of Alexander II. His "Kur la-Zahab" is in two parts; the first part (ib. 1858) is a commentary on 109 difficult haggadic passages of both Talmuds, preceded by a long introduction treating of the Haggadah in general; the second part (ib. 1866) contains an essay on the religious dogmas and views of the ancient Talmudists and a commentary on 138 haggadic passages. 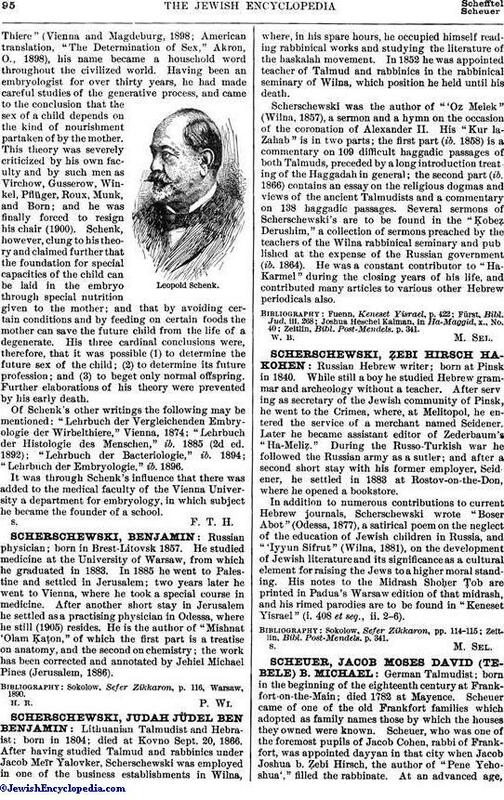 Several sermons of Scherschewski's are to be found in the "Ḳobeẓ Derushim," a collection of sermons preached by the teachers of the Wilna rabbinical seminary and published at the expense of the Russian government (ib. 1864). He was a constant contributor to "Ha-Karmel" during the closing years of his life, and contributed many articles to various other Hebrew periodicals also. Zeitlin, Bibl. Post-Mendels. p. 341.